Linoleum has a reputation, and it’s not usually a good one. Ceramic tile, on the other hand, is known for its amazing sheen, strength and beauty. For real professionals, tile is easy to work with and looks great on virtually any surface: kitchen and dining room floors, bathroom walls and anywhere else you want. There’s no comparison here. Gorgeous tile literally lasts a lifetime, giving you decades of beautiful moments as a family. Enjoy breakfast together and unforgettable laughter with loved ones. Telling prospective buyers that your kitchen or en-suite bathroom has linoleum isn’t going to win you any points. High-quality tile installation, however, has an immediate effect on your home’s value due to the desirability of tile flooring for couples and families alike. Beautiful surfaces add to a room’s ambiance. The right tile can give kitchens a modern, minimalist feel or provide a relaxing touch perfect for country comfort. Style, elegance and décor possibilities are endless with luxurious tile flooring. Great tile maintains vibrant colors and patterns for ages. This makes it very useful in creating dynamic color combinations and styles that wow guests. Cleaning a tile floor usually only involves regular sweeping and mopping. That’s it. 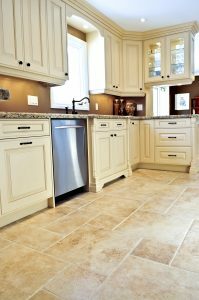 If kitchen accidents lead to a broken tile or two, you only need to replace those tiles, not the whole floor as in the case of linoleum. Linoleum may seem like the cheapest option at the time. However, when you take into account the number of years high-quality tile lasts with a single installation, ceramic tile is actually a more cost-effective solution. To get the best results from your favorite tile floor, make sure to speak with the flooring retailer for professional tile installation.